My main reasons for choosing PGPM were- batch diversity, batch mates with similar or more experience in the industry, excellent top notch faculty, and focus on industry interaction. Today, I am exposed to happenings of different industries. There is a paradigm shift in my approach to solving issues. I’m better positioned to lead teams. And I would attribute these changes to SPJIMR’s famed teaching pedagogy. The learning curve at SPJIMR takes you well beyond borders to maximise the variety of knowledge bases available to a global business manager. Our PGPM programme's three-week International Immersion module is a constantly updated, tailored curriculum offering you an opportunity to pursue advanced courses in a chosen area of super specialisation. This is followed by an exciting opportunity to work on a live project. I feel more confident on how to handle complex problems and provide solutions after completion of this programme. I feel the Cornell experience along with my enriching experience at SPJIMR will add immense value to my profile and will help me stand out. Thank you SPJIMR for this opportunity." This involves working with NGOs in a rural setting for about 2 weeks. This two week module will help you appreciate the way non-profits grapple with promoting big ideas as they build their networks and organisations with little power and limited resources. The Centre for Development of Corporate Citizenship (DOCC) was established with a view to bring management education closer to reality in the Indian context. DOCC also exposes participants to the dynamics of life in rural India, where modern day tele-connectivity has opened up new opportunities while many of the traditional challenges like poor infrastructure remain. You work on a 10 day project to be implemented in socially or economically disadvantaged sectors in urban/rural areas through a variety of activities that include field visits, consulting and research in the social sector. Your project reports are evaluated by an expert panel comprising faculty, representatives of NGOs and corporate leaders. DOCC provided us with an excellent opportunity to put our MBA learning to practice in a meaningful and organised manner. We witnessed farmers realising their potential as entrepreneurs with assistance from Swades Foundation and we are able to meaningfully help these farmers of Raigad by identifying the potential markets for their produce. Creating value and enabling people are experiences to take away and not just memories. At SPJIMR, we stress on honing your skills with a unique three pronged approach of Knowing (knowledge), Doing (skills) and Being (attitude). The effort is made to build suitable stimuli into non-classroom learning. You will benefit from our globally acclaimed and award winning value- based leadeship development modules like Assessment & Development of Managerial and Administrative Potential (ADMAP), the Personal Growth Lab (PG Lab), the Development of Corporate Citizenship (DOCC) and the Science of Spirituality (SOS). Our annual conclave - Samavesh, which brings top business leaders on campus to interact with students, participate in panel discussions and enable a rich exchange between business and academics. We believe that professional clubs, if functioning well, will have a great impact on the personality and placements of the participants. These clubs are platforms for participants to interact with alumni and professionals in their fields of interest. This helps them to build formal and informal networks while exploring career opportunities. Team SPJIMR proved their mettle beyond classrooms by defeating K.J.Somaiya in the semi-finals and NMIMS in the finals to clinch the gold medal during Samarthya ’16, NMIMS’ inter college sports festival. PGPM was represented by Anuj Talwar, Sahil Singla and Sameer Gupchup. 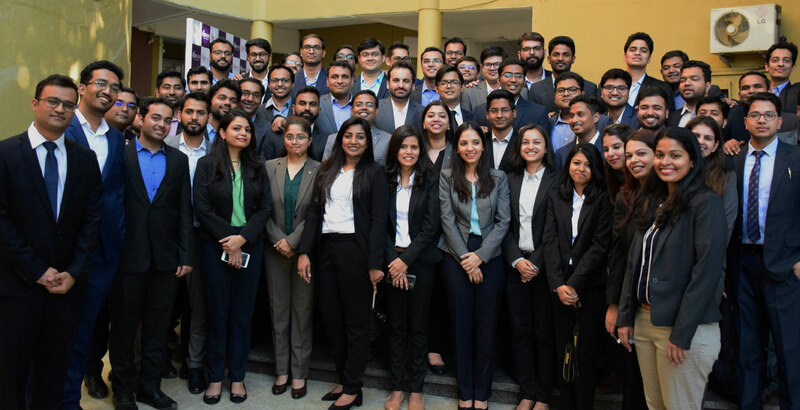 PGPM participants - Nikhil Bindraban and Gaurish Awasthi beat teams from several IIMs, XLRI and other leading B Schools to bag the first prize in ‘Engage – A case study’ competition organized by XLRI, Jamshedpur. March 8, 2019 saw one of its kind celebrations in SPJIMR campus. The International Women’s Day was celebrated with much enthusiasm by the students and staff alike. On Sunday, 3rd February 2019, the students of PGPM 2019 had the opportunity to understand the nuances of the latest budget, with Dr. M. Govinda Rao, who has been a member of the Fourteenth Finance Commission in the past shedding light on the budget as a whole and giving it an unbiased view. A group of nine participants from the PGPM Class of 2016 attended the flagship ‘Make in India’ event in Mumbai on February 14, 2016 and interacted with a galaxy of corporate leaders who were present along with the Union Finance Minister Arun Jaitley to discuss growth opportunities in India.. The S.P. Jain Institute of Management and Research (SPJIMR) held the Graduation Ceremony 2016 on Friday, April 15. The graduating batches included PGDM, PGEMP and PGPM, who came together on campus, celebrating their respective journeys at the Institute.